Jason tries to save himself by encouraging scheming, but it's pretty much no use. Everyone is too busy watching Mark the Chicken eat a grub than actually heed Jason's words. People do listen to Jason in this awesome ocean balancing maze though, where his leadership skills lead to him, Michele, and Tai winning a day of food and wildlife reserve fun. If you've ever dreamed of a monkey flying at your head for a banana, just know Jason, Tai, and Michele lived this dream. The majority alliance is finally starting to fracture a bit. 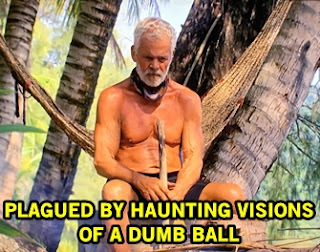 Joe's pretty ornery after failing at the "dumb balls" in the challenge... or maybe simply because he's old and starving. He's a little too bossy for Cydney's liking who wants to eat coconuts and sweat in the natural Cambodian heat instead of around a fire. The dichotomy between Cydney's "Tortoise and the Hare" challenge victory over Joe's inability to spell "Immunity" in stacking blocks is pretty epic. 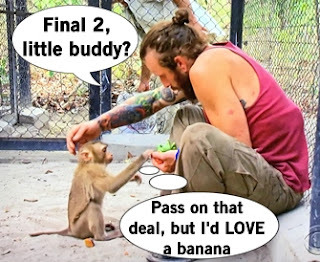 On the other side, Tai is concerned that Michele has no enemies on the jury and is the biggest threat left. The group just looks at Tai sorta awestruck at this proposition; even Jason's like "What dude?" and he's the person likeliest to go home. Aubry agrees with Tai that Michele is a threat, but Cydney doesn't appreciate Tai trying to dictate the game. "It's like Sophie's Choice," Aubry says about the voting. Eh, close enough! 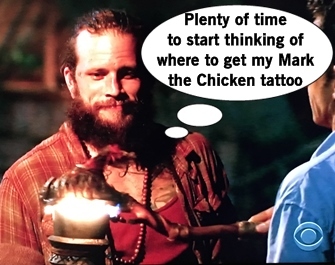 Tribal Council time! Probst uses the unpredictable Immunity Challenge as a metaphor to the ever-changing game because he's so deep. Tai pulls off a personal miracle at Tribal Council by not totally spilling the beans about his advantage (only Aubry and Joe know what it is), but regresses back to his TMI talks. Tai even goes so far to say he doesn't even understand why Michele's in the alliance and wondered why they had an extra person. Tai's honesty is hilarious as a viewer and must have caused ulcers for all his allies in the game. Michele actually makes her presence known at Tribal Council by calling out Tai's pecking order, throwing the word "malarkey" into the mix for the Triple Word Score. Jason finally gets to talk again, hoping that maybe the Tribal Council chaos could save him but figures it's probably still him. After everyone votes, Tai announce to Probst that he wants to use his advantage to cast an extra vote. Tai totally wastes his two votes on Michele while the rest of his alliance vote Jason out. The cursed extra vote strikes again, but maybe not as badly.